The whirlwind season of New York, London, Milan and Paris Fashion Weeks has come to a close and there were so many unique looks shown for Fall/Winter 2014. However, it was impossible to ignore the "it" item still prevalent in numerous collections: the pink coat. This item has actually been popular for a few seasons, and the most recent runways prove that this new classic is not going anywhere. While pastels are always in the Spring fashion forecast, a huge plus is that you can wear this now and through the end of the year as an unexpected neutral to balance out Fall and Winter's darker hues. 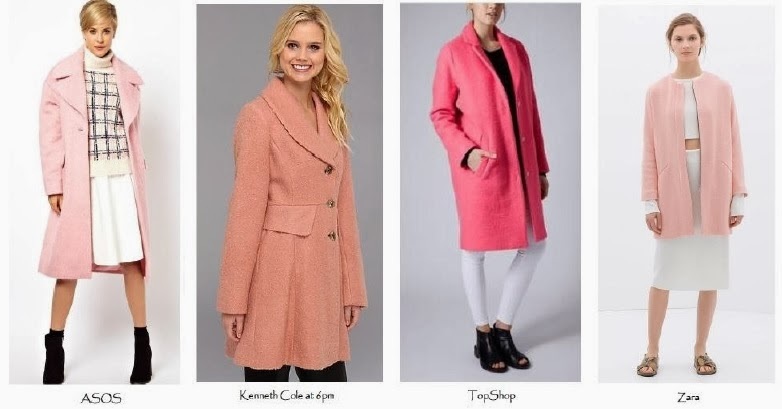 These designers show that the pink coat is far more versatile than it sounds. Burberry Prorsum showed a wool version with a thick scarf thrown over one shoulder- a cool new way to accessorize outerwear. Carven's salmon coat featured a half-zip closure and showed how you can introduce prints to your ensemble with a wide leopard lapel. At Christopher Kane, an angled and embellished hem adds modern edge to the pink coat. A sportier version stood out in Fendi's collection, paired nicely with army green to show how earthy tones can work well with a pink coat. Giambattista Valli's pink coat had swinging peplum wings lined in pink's chic counterpart: red. Givenchy featured a glamorous take with a blush-colored coat upgraded by a fur lapel and fur sleeves. The pink coat at Gucci had a sixties-mod, double-breasted silhouette. Paired with a pink turtleneck, this proves that this monochromatic style can look very polished. A cape, like the pink suede version at Ralph Lauren, is a cool spin on the trend. When styled with varying textures, such as cableknit and cotton, the aesthetic is effortlessly chic. Rochas featured a loose wool version in the popular oversized cocoon silhouette.